These tiles presumably dated from the 17th century, were removed in time from the stairs ornamental wainscot of one of the many old buildings being demolished in Lisbon. 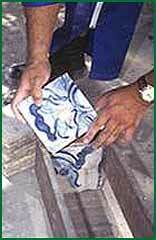 The removal of this type of tiles when they are going to be used again must follow some techniques, that due to their complexity should be performed by qualified technicians, in order to avoid irreversible accidents. 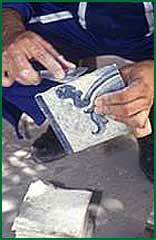 This type of tiles although they often present some pathologies, can be removed, renovated and recuperated, the latest technique difficulty depending on the support and its laying mortar. Being thus possible to relay them on the same place or on a totally different place, and continue to perform their function. In this case we used this tile panel to decorate the dining room of a Marquis of Pombal building we renovated in Lisbon. After estimating the new areas to cover we concluded there were not sufficient tiles and that it was necessary to produce new ones of rough material and similar shape as the original tiles, always in accordance to what is written and agreed upon in the Letter of Venice. 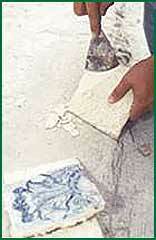 Details of the cleaning of mortars from the tiles unhewn inner side after being removed. This process, due to the fragility of the tiles, requires a great deal of effort and patience so as to obtain a clean rough material without dry mortar that will make it impossible to relay them again. Afterwards it is necessary to pack the removed and cleaned tiles, and wooden boxes adapted to the type of tiles are built allowing safe packing and avoiding spaces in between and possible vibrations that could damage the glazing and the rough material.